We went to Barcelona recently, as my wife has CP, she finds steps hard work, my arm also gets a good workout supporting her if we have too many steps to face. Most metro stations seemed to have many lifts going down from the road to the ticket offices. The lifts for a single metro station are often spread out over many roads, and their locations are not marked on the map in any of our guide books. Most metro stations seemed to have many ticket officers that joint to each other with lots of steps and corridors. So if you go down the lift that is next to an enhance that is signed posted for the line yoy want, you often get hit with lots of stairs after it is too late to turn back, as you have already used your ticket. Firstly how can you tell if a given line is accessible at a given metro station? How can you tell how many steps and in what direction (up or down) you have to cope with at a given station/line when there is not step-free access? Our overall impression of the metro system was that it is accessible to locals that know it, but not to tourists due to the lack of sign posting. This website lists all the stations with lifts. 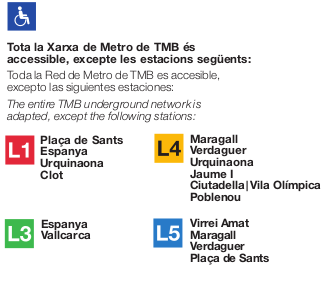 TMB also says that you can locate accessible stations using their interactive station map. The map shows the location of the metro street accesses as well as which stations are accessible. You can also try to locate the lifts using street view. How Much Step Free Is Actually Step Free? I could not find information on how many steps separate the ticket barriers and the platform, in both accessible and non-accessible stations. However, according to this website, accessible stations have lifts from the street to the platform. There exists a subset of "partially adapted" stations where there is a height difference between carriage and platform. In these stations you are likely to find metal ramps that should solve the problem. The best thing you can do is to contact a member of staff in the station you plan to use, and ask them for help navigating the system. I am prepared to bet that you'll find them very helpful. 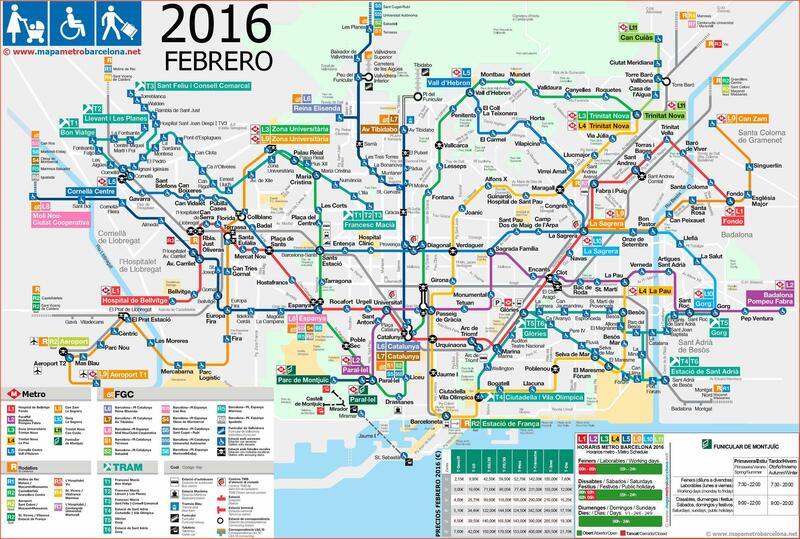 I think you should look for the disabled metro map, which is easily to find on google. I would explain more but I think the image says pretty much all. You will have to zoom to read which stations have "annoying stairs" and stations with elevator. About the steps that separate the ticket barriers and the platform, you can't really know, but I highly suggest you to check the signs for lifts inside and outside the metro. In summary, I agree with you about the signals and everything in the metro of Barcelona, not being very intuitive for tourists. It happened to me the first time too, until I got used to it. Not the answer you're looking for? Browse other questions tagged trains public-transport tips-and-tricks barcelona accessibility or ask your own question. Is Tokyo Metro accessible to people with movement disabilities? At Brisbane Cultural Centre busway station, how do you know where on the platform to wait for a given bus?